Due to unfavorable weather conditions at Indianapolis Motor Speedway early on Sunday afternoon, specifically low clouds and rain, the Race Committee was forced to cancel the final of the Challenger Cup. This meant that the Challenger Class race podium at the iconic motorsport oval was based on Saturday’s Qualifying session, with pilots awarded 50 percent of the points. The final season tally gave the repeat Challenger Cup to Bergér, at 38 points, with Sweden’s Daniel Ryfa (34 pts) taking his fourth consecutive overall podium in second place, and Luke Czepiela of Poland (34 pts) earning his first overall podium in third. “On the one hand I’m very happy to have won, but I would rather have flown to lose or win the first position here. 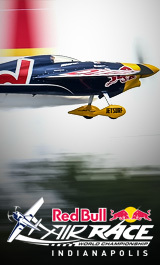 So I’m a little bit disappointed not to fly, but it’s great to have a second overall title,” said Bergér. The Challenger Class was introduced to help outstanding pilots build their Air Racing skills to the elite level to potentially race in the Master Class that competes for the World Championship, and Astles was elated to complete her second season of competition on the high note of her first race win. In addition to rewriting the record books as the first woman ever to win a major motorsport race at Indianapolis, she became the first woman to win a race on a Red Bull Air Race weekend. Czepiela earned second place for the Indianapolis race, and Great Britain’s Ben Murphy was third. With conditions improving, the Master Class race that will determine the 2017 Red Bull Air Race World Championship is underway at Indianapolis Motor Speedway.